Korong shire (1864-1995) was proclaimed on 6 September 1864, and was the successor to the Kingower and Wedderburn Road District (1861). The shire’s area originally included the gold towns of Kingower, Rheola and Wedderburn, but not Inglewood which was a separate borough until 1961. It also included the agricultural townships of Charlton, Korong Vale and Wychitella, but the Charlton district was severed from the shire in 1895 and made a separate shire. Korong was named after Mount Korong (364 metres above sea level), 12 km south-east of Wedderburn. The mount was climbed by the New South Wales Surveyor General, Thomas Mitchell, on his Australia Felix expedition in 1836. According to Bunce's Language of the Aborigines of the Colony of Victoria (1859) Korong is an Aboriginal word meaning canoe or boat. 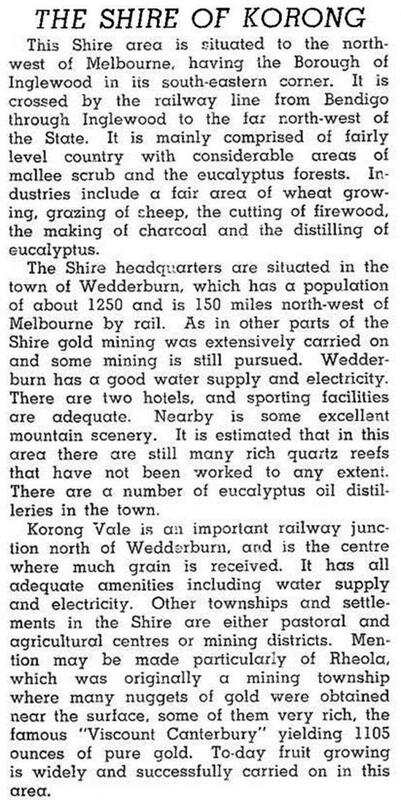 The Wedderburn goldfield was first named the Korong or Mount Korong diggings. The shire was chiefly known for its goldfields at first, but the opening of railway lines west of Bridgewater to Charlton and Wedderburn during 1876-87 brought the wheatlands within readier access to metropolitan markets. There were also flour mills at Charlton (1870s-1976), Wedderburn (1882-1919) and Bridgewater (1873-present). The eastern boundary of Korong shire was the Loddon River and the western boundary was partly the Avoca River and partly an irregular line passing near Backrabunyule. Road access was the Calder Highway. The shire office was at Wedderburn. Around the old gold towns there are extensive forest reserves which have been used for eucalyptus-oil production and timber cutting, but are now chiefly for the conservation of flora and fauna. Korong shire had an area of 2385 sq km of which 65% was used for farmland in 1994. It carried 269,000 sheep and lambs and 3857 cattle. Wheat production was 28,187 tonnes and barley amounted to 12,494 tonnes. On 19 January 1995, Korong shire was united with East Loddon shire, most of Gordon shire and parts of Bet Bet, Maldon and Tullaroop shires to form Loddon shire. The 1961 and later figures included Inglewood borough.